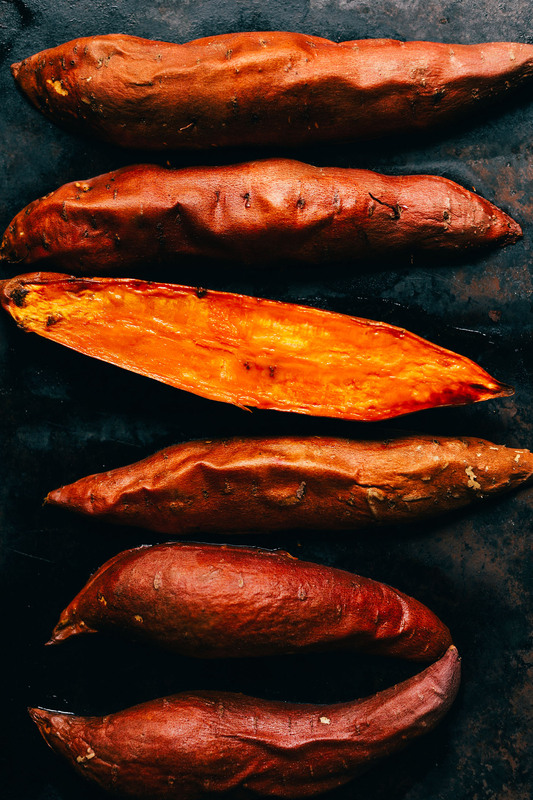 A quick and easy, fool-proof way to roast the perfect sweet potato every time in HALF the time. Plus, two delicious topping ideas! Preheat oven to 375 degrees F (190 C). Cut potatoes in half lengthwise and transfer to a baking sheet. Drizzle with a little oil (if avoiding oil, omit) and massage to coat. Place cut side down on the baking sheet. Bake for 25-35 minutes, or until caramelized on the edges and when you press on the top of the potatoes they have a little give. Enjoy as is, or top with desired toppings. For sweet, go for nut butter, banana, and granola. For savory, go with black beans, avocado, salsa, and cilantro. Best when fresh. Store leftovers covered in the refrigerator up to 3 days. Reheat on the stovetop in a cast iron skillet until hot. *Nutrition information is a rough estimate calculated with oil and without toppings. Do you scoop the potato out with a spoon or do do you eat the skin too? this is so awesome! My daughter loves sweet potatoes but dinner is always last minute so we don’t have time to wait an hour. I cooked 4 sweet potatoes with your recipe and they were done in 25 minutes! I loved this! I needed a fast lunch and wanted a sweet potato but didn’t want to wait a whole hour. I ate it sweet and savory. But can I make one request, can you please share your music playlist? I love all the songs you have with your videos and can’t seem to find the music that goes along with all of them. So I end up having your videos replay so I can listen to the songs. Thank you for the suggestion, Peitra! I’ll be sure to pass it along :) We are glad you enjoyed this recipe! Hi! You used to have a recipe on this site where you would take a sweet potato, roast it, scoop out the inside and mix it with spinach (or kale, can’t remember) and add an optional cashew cinnamon sauce. I made it a few years ago and was looking for it again but can’t find it! Can you link me? I am thinking that was likely an older recipe that has since been replaced with newer ones and no longer exists! Sorry, Megan! Thi s recipe is so simple but so delicious!! I made some breakfast sweet potatoes this morning. Using this recipe to roast the sweet potatoes last night, I reheated them this morning and added some apple chunks and almond butter to the top and I’m loving it! Have yet to try with the avocado oil, but the coconut oil roasting is a win in my book. Thank you for the recipe!! Yay! We are glad that you enjoyed it, Amanda! I was wondering if beets can also be roasted in the same way. If so, I would love to cook them together! Thank you for posting this! I used your method but with Japanese sweet potatoes and I added cinnamon and turmeric. They were incredible! Hi therefore the banana one is that oats of some sort and currants? It looks yum, can’t find the recipe. Thank you. Blueberries! You can find the recipe here.